This is my little project that I have been wanting to get done for a while now. With so much craziness in the world, one can never be too careful. You should all see the movie Red Dawn and you will know what I'm talking about. It was super cool. Hopefully we won't ever ever ever have to use these, but it feels awesome to be prepared. So basically what I did was research on various blogs/pinterest the best items for 72 hour kits. I combined that with an amazing wedding gift we received that had a ton of cool stuff that I will show ya. So above are the items we got in our wedding gift. 2. Two awesome black hats with lights on the front. 3. 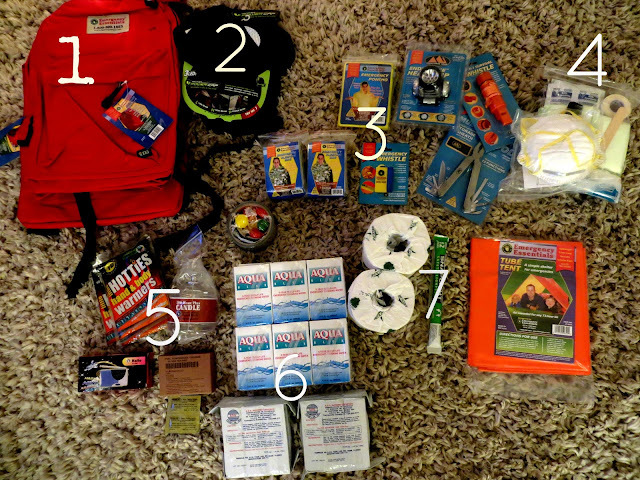 Emergency blankets/ponchos/head lamps/whistles/pocket knife/duct tape/hard candy. 4. First aid kit. Includes masks, tape, bandaids, medical tape, surgical gloves, feminine products etc. 5. Hand warmers/candle/mini radio/water purifying tablets/firestarter. 6. Prepackaged water/high calorie food bars. 2. 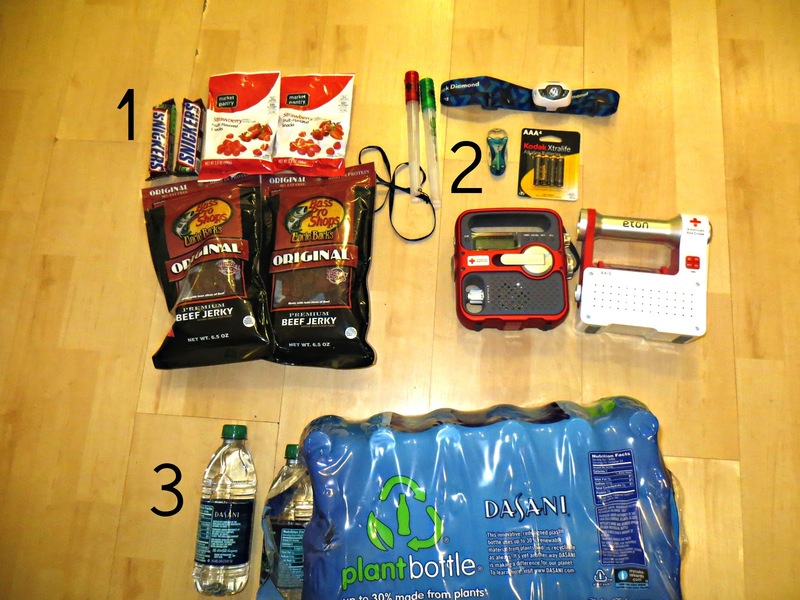 Light sticks/head lamp/batteries/pocket knife/2 radios with tons of different functions. and here I am thinking I'm really hilarious with my head light on. 1. Copies of: birth certificates/ID's/legal papers/cash... etc. But this is a good start!